Model 2572A, is a dual-channel frequency agile waveform synthesizer combine industry leading performance, frequency agility and modulation capability in a stand-alone, bench-type product. Signal outputs in the range of 1Hz to 250MHz and 16-bit vertical DAC resolution provide the test stimuli required for the decades to come. 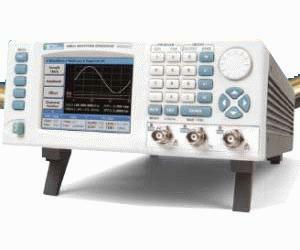 It can be used as an arbitrary waveform generator, modulating generator, as well as function and pulse generator.